I am usually not an impulsive buyer when it comes to makeup products, because I'd like to read some reviews and then decide if it suits me or not. This especially applies to high-end products because if I'm gonna splurge, I need to know that it worths all the pennies! However when I saw this limited edition cheek palette on SpaceNK's website, I'm sold.. Couldn't wait for the Black Friday sale, I rushed to the local Sephora and got this bad boy the next day. I have heard so much great things about Nars blushers, but every time standing in front of the counter I'm so overwhelmed by all the shades and end up not able to make a decision.. One Shocking Moment is a great palette for trying out multiple shades at once. 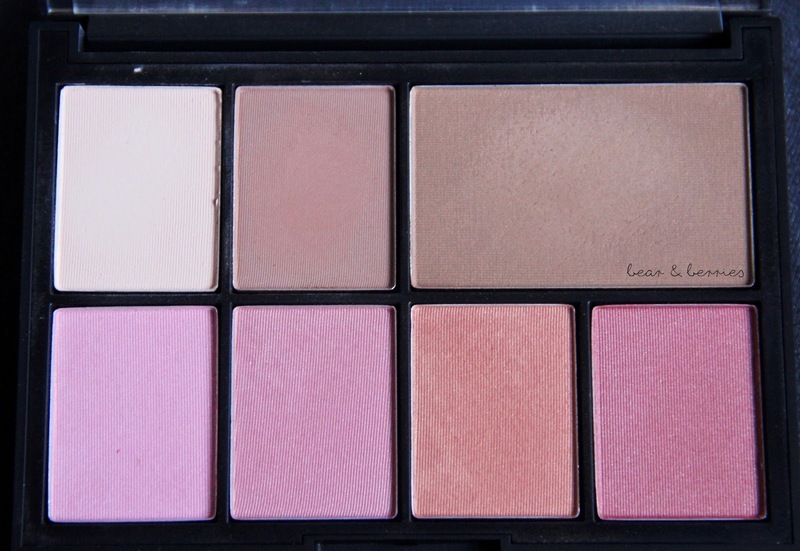 It consists of a contour blush duo; Laguna bronzer as well as four beautiful blushes. After we do the math it turned out that this palette is pretty much a bargain! Paloma Contour Blush Duo: These are probably the most interesting ones in this palette. First of all the highlighter is completely matte, secondly the darker shade is not a contour but a contour blush.. I was so confused but this video made by Nars has answered most of the questions in my mind. The contour blush shade is gorgeous, due to it's rosy undertone it's not suitable for contouring the hairline or the nose, I use it either as a contour under the cheekbone or as a subtle winter blush, it performs beautifully either way. However I haven't totally got the hang of how to use the highlighter properly yet..
Laguna Powder Bronzer: When I swatched this for the first time I thought it is way too shimmery, what's all the hype about?! It turned out that my worries were unnecessary, Laguna doesn't look shimmery on face at all, instead it gives a beautiful healthy glow. The shade is perfect for my NC20-25 skin tone. Robotic: Robotic is a youthful cool toned pink with silver shimmer in it. It's my kinda shade, I'll surely make a lot use out of it in spring and summer. Blasphemy: This is another everyday shade. Pink coral with subtle golden shimmer in it. It suits any any skin tone and makeup look, a very versatile one. Luster: This shade is a bit tricky... Nars official website describe it as a "sheer golden apricot", I'd say it's more golden than apricot. It is so shimmery on me so I haven't made a lot of use of it yet. Dolce Vita: It's a matte berry shade, a perfect autumn/winter shade. The only thing is that it's very pigmented so you need to be very light-handed with it, a tab on the brush is more than enough. What do you think of this palette? What gift set is on your Christmas wishing list?